Goodreads Summary: Last spring, Nikki Beckett vanished, sucked into an underworld known as the Everneath, where immortals Feed on the emotions of despairing humans. Now she's returned- to her old life, her family, her friends- before being banished back to the underworld... this time forever. When I saw the summary for Everneath a few months ago, I thought it was another retelling of the Hades and Persephone myth (it’s not) and that it involved a love triangle (it doesn’t). Instead, Everneath mixes Egyption mythology with a fresh take on the myth of Orpheus and Eurydice, a unique combination that I have not seen in YA paranormal books. When we meet Nikki Beckett, she has just returned from Everneath, a realm for immortal beings called Everlings, but everyone assumes that she was a drug addict and runaway since she disappeared for six months without a trace. The story is told in flashbacks, so in addition to reading about what’s going on in the present, we also find out the circumstances that led to her being in Everneath in the first place. While the story unfolds slowly, it kept me on the edge of my seat waiting to find out exactly how Nikki ended up in her situation. Nikki is an interesting character. Prior to going to Everneath, she was very insecure in her relationship with her boyfriend, the popular and handsome starting quarterback, Jack. While it saddened me to read about this girl who thought she was not good enough for a boy, her feelings of insecurity are very important to the book’s plot. I didn’t love Nikki but I didn’t hate her either. She made some poor decisions that led to horrible consequences and now she has a hard time living with these consequences. As for the boys, I loved Jack! He is a great example of love, forgiveness and sacrifice. Jack may just find himself on my list of favorite book boys for 2012. I’m probably supposed to hate Cole, he is sort of the villain in the story, but I’m more intrigued by him than anything else. Cole is an Everling, an immortal being who lives off the life energy of humans. Even though Cole is pretty much a parasite, I don’t hold him responsible for Nikki’s situation. She gets all the blame for that. I’m really hoping to learn more about Cole and the political situation in Everneath in the sequel. There are mentions of an evil, life sucking, homicidal queen of Everneath and who can resist learning more about her! With its unique mythology and an ending that left me dying for more, I cannot wait to read the second book in this series. 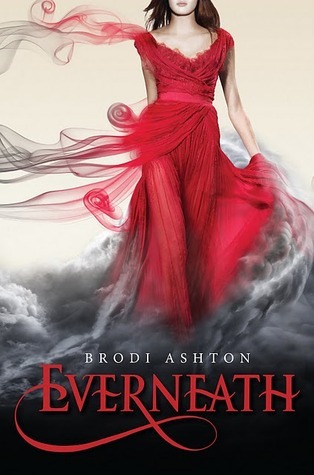 Everneath is a wonderful debut novel by Brodi Ashton and I am looking forward to more from her. I highly recommend this book, especially to readers who love all things mythology (like myself). This is on my list!! Somehow I got the impression that this book did have a love triangle; that put me off although I'm still interested in reading it, based solely on the lovely cover! Thank you for clarifying that point for me. I'm so glad you enjoyed it! I really liked Nikki myself, but she definitely made some big mistakes. I absolutely loved Jack as well and even though I find Cole intriguing, I just couldn't like him in the story! He felt like someone just there to ruin the so perfect relationship. So, I don't hate him, but I disliked him in the story! But I know many actually loved him a lot. Great review! No love triangle, Egyptian mythology and a gorgeous dress on the cover? Count me in! Everneath sounds really different and fresh.